Adoption Process « Rescue K911 is an animal shelter located in Camp Hill, AL. The first step is to fill out an online adoption application. You can find a terrific selection of dogs waiting to met someone just like you right on this page. If you find one you love, please put his or her name in your application. Or, if you still aren’t sure which dog is right for you, contact us. Our volunteer/adoption specialists love playing matchmakers. They’d be delighted to hear from you or you may indicate so on your adoption application. The application is forwarded to our Adoption Team who reviews all information. We then will call & talk to you on the phone about the dog you’d like to adopt, and tell you more about any of his or her special needs, personality, etc. Then we will make arrangements for a home visit. This helps ensure that the dog you’ve selected is the right fit for you. We encourage potential adopters to also make an appointment to come to Rescue K911 to meet the dogs and determine if the one they have chosen is right for them & their family. They come to us in so many ways: abused, abandoned, hurt, sick, lost, unwanted & unloved. 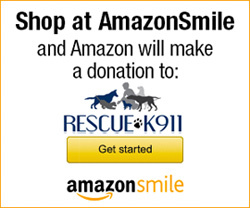 Your support means so much…A sanctuary for the homeless, Rescue K911 is dedicated to providing food, medical care & shelter, along with caring hearts & loving arms. Giving each one another chance at life and love. Making a difference, one precious life at a time.